Nothing beats old fashioned, just-like-Grandma-used-to-make fried chicken! Whether it’s legs, drumsticks, thighs or the whole chicken itself, there’s just something about fried chicken that provides a little bit of comfort! Here are our favorite places to get it in Indiana. The Bluebird Restaurant in Morristown, Indiana, has been a must go to since the mid 1940s. It’s a great place to unwind after a long day and to spend time with friends and family. Enjoy classic restaurant options as well as bar food favorites, in addition to five TVs, a pool table, free Wi-Fi and a smoke-free environment. It’s good old fashion comfort food at its finest, from the homemade, lumpy mashed potatoes to the homemade gravy—and of course let’s not forget the chicken! Choose the restaurant’s infamous Fried Chicken Dinner and be prepared to lose yourself over its crispy goodness! Soft and tender on the inside, crispy and crunchy on the outside! The Eagle at Mass Avenue knows how to do fried chicken. It starts with cage free and free roaming, all natural chicken that is brined and dropped into custom built fryers, followed by a little kick from the Eagle’s house made hot honey dipping sauce. It’s everything one images they would find down in the south but are surprised to discover exists right here in Indianapolis, Indiana! Be prepared to have a napkin at the ready! 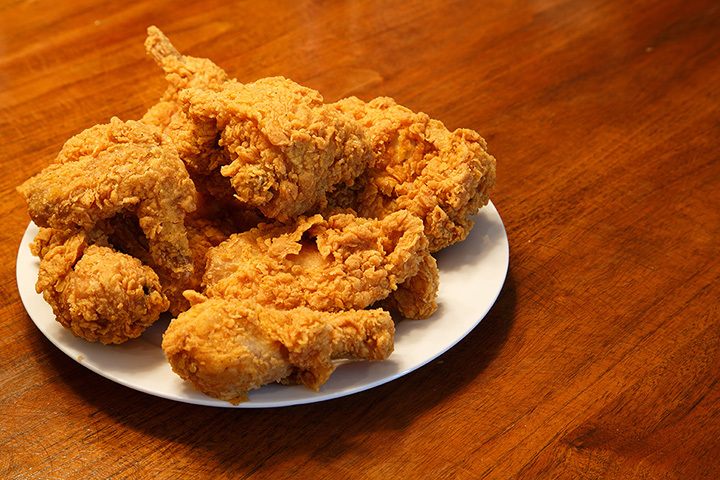 Everyone knows that Kokomo’s Country Squire Carry Out is the best place to go for fried chicken, up some of the delicious, crunchy, mouthwatering chicken since 1965. Once you try their tender Broasted Supreme chicken, you’ll never look at another chicken the same way again. Be sure to pair it with an order of homemade potatoes and gravy or homemade mac and cheese! The Iron Skillet Restaurant is located at 30th Street and historic Cold Springs Road, and its where skillfully prepared meals and a beautiful, genteel, comfortable atmosphere come together. The restaurant itself is located within the Wacker Home, a beautiful 1800s historic home that is conveniently located to nearby Marian University, making it a favorite spot for students. In April and May, it becomes a hot spot for racing enthusiasts during the Indy 500 activities. The restaurant serves its meal in a ‘family style’ manner, meaning all the fixings! Guests have their choice of light or dark skinned Skillet Fried chicken, as well as a bowl of creamy chicken gravy and made from scratch baking powdered biscuits! Good old Mayberry! This family friendly diner has been serving customers and inviting them to step back in time for an old fashioned, home cooked meal since 1989. The Mayberry Café is where you expect Barney and Gomer to walk in and sit down for a cup of coffee before heading down Main Street. Aunt Bee was kind enough to share her famous 3-piece Fried Chicken dinner, which features deliciously tender, crispy chicken with just enough batter for the added crunch that everyone loves about fried chicken. It’s a family friendly place where there is something for everyone! The Hollyhock Hill Restaurant in Indianapolis, Indiana has been specializing in family style dining since the early 1920s, when V.D. Vincent and his wife began serving dinners at their country cottage in Northern Marion county. The Hollyhock Hill is one of the few ‘family style’ restaurants left in the US and is committed to serving customers the most delicious fried chicken they’ve ever tasted. Ann’s By the River is located in downtown Jeffersonville, Indiana, and has been family owned and operated for the last 25 years. Ann is a legendary country cook and demands that everything be made completely from scratch, even the potatoes. The atmosphere is country casual and Ann and her family pride themselves on providing visitors and locals alike with food just like Grandma used to make. Ann’s homemade fried chicken is made with only the best ingredients. It’s tender and juicy, and has that perfect crunch with every bite. J’s Dairy Inn is located within the small town of Liberty, Indiana and has been a beloved favorite for locals and visitors alike since the late 1950s. The restaurant is family owned and operated, and its rustic style is reminiscent of the old Dairy Queen style with two walk up windows. They’ve seen many style changes over the years, including remodel after a devastating fire in the early 1980s, but the one thing that hasn’t changed is the chicken. Everything is “fried” or “grilled to order.” Choose from one of their “Chicken by the Bucket” specials or create your own with their ‘Pick Your Pieces’ bucket. You won’t be sorry! You know a restaurant has to be one of the best when Guy Fieri comes to town! The Metro Diner was featured on Food Network’s very own “Diners, Drive-Ins and Dives” a few years ago where Fieri declared that “Diners across the world have to take a lesson on this one.” It’s the fried chicken and waffles that keep customers coming back for more as well as the Fried Chicken Plate. Soft, crispy, crunchy buttery goodness awaits your taste buds here! Teibel’s Family Restaurant in Schererville, Indiana, has been serving Northwest Indiana for over 80 years! Teibel’s started as a 12-seat highway diner between Routes 30 and Highway 41, and brothers Martin and Stephen Teibel had no idea how quickly they would soon be growing as word spread from town to town about how Teibel’s had the best homemade fried chicken. Though the restaurant has grown in those 80 years to a full-service family restaurant, catering and banquet hall, with a formal dining room and a casual café, one thing remains the same: Grandma’s favorite homemade fried chicken. The batter is light enough for that crunchy taste and the homemade seasonings give it that extra special touch!